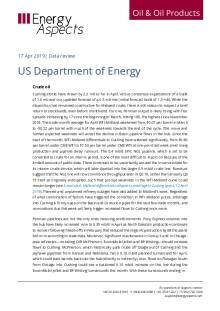 We will not be publishing our review of US oil demand and trade for November 2018 today. The EIA reported that it was unable to obtain accurate import and export data due to the US government shutdown and has used average levels from October as a substitute in its November data release. As a result, we expect significant revisions to the EIA's oil demand and tradedata in the next PSM release at the end of February because net trade is a component in the calculation of product supplied, the EIA's term for demand. The US Census Bureau is expected to release November trade data on 6 February and we will use this data to prepare an estimate of what we expect the revised EIA data to be for November 2018. We will release this report on 7 February. US total liquids production came in at 17.65 mb/d in November, up m/m by 0.34 mb/d and higher y/y by 2.23 mb/d versus our estimates of 17.17 mb/d. Crude production increased m/m by a massive 0.35 mb/d to 11.90 mb/d, up y/y by 1.80 mb/d. This was much higher than our projection of a 0.15 mb/d increase m/m, driven by the Gulf of Mexico (GoM) coming in higher by 0.19 mb/d m/m versus our 0.10 mb/d m/m increase estimate. Permian output also outperformed, with Texas and New Mexico production coming in higher m/m by 0.15 mb/d versus our expectation of 60 thousand b/d increase. The increase in the October 2018 frac count (+6% m/m) likely underpinned this massive increase, as peak output for most unconventional wells occurs in their second month of production. Similarly, in February 2018, the frac count rose by 7%, and Lower 48 onshore production rose the following month by 0.24 mb/d. The frac count rose by 1% m/m in November before falling sharply by 4% m/m in December, so production growth likely moderated last month and further in January. NGLs output totaled 4.57 mb/d, lower for the second month in a row and up y/y by 0.47 mb/d. Other than the Permian, output growth in all other onshore basins was muted and in line with our forecasts. Colorado and Wyoming production (a proxy for the Niobrara) rose by just 16 thousand b/d m/m to 0.76 mb/d, concentrated in Colorado with only 1 thousand b/d of growth m/m coming from Wyoming. Production in Oklahoma and Kansas (a proxy for the Anadarko basin) rose by 2 thousand b/d m/m to average 0.67 mb/d (higher by 72 thousand b/d y/y). North Dakota production fell m/m by 11 thousand b/d amid poor weather. Alongside the slowdown in production that service companies have been warning of likely showing up in January, cold weather across North America is also poised to threaten production. Some freeze-offs have been included in our Bakken forecast; however, this level of cold has not been seen in 25 years, so risks to production are on the downside for the northern part of the country. That said, Permian capacity restrictions may be relieved earlier than previously expected, with the EPD NGL-to-crude conversion line now expected to start partial service as early as February. This adds 0.20 mb/d of capacity out of the basin (from April) and will require 1.2 mb of linefill on our calculations, possibly pushing Permian production higher in Q2 19. As a result of increased takeaway, WTI-Midland is now pricing close to $55 per barrel, the inflection price point for growth to pick up materially according to our model. Due to these happenings we have raised our production forecast by 0.15 mb/d, driven by increases in the Permian.